Tommy Robinson and his ilk are marching in the capital on December 9. The Labour Party must get involved in the resistance - now. Forces of far right reaction are on the rise across the globe. Last summer, growing street demonstrations decrying “free speech” and featuring incitements to anti-immigrant vigilante violence solidified a new British form of far right street movement. In June, one far right march mobilised well over 10,000 people in central London. Emboldened by their success and imbued with momentum by brewing popular discontent surrounding the Brexit negotiations, they have no intention of retreating. 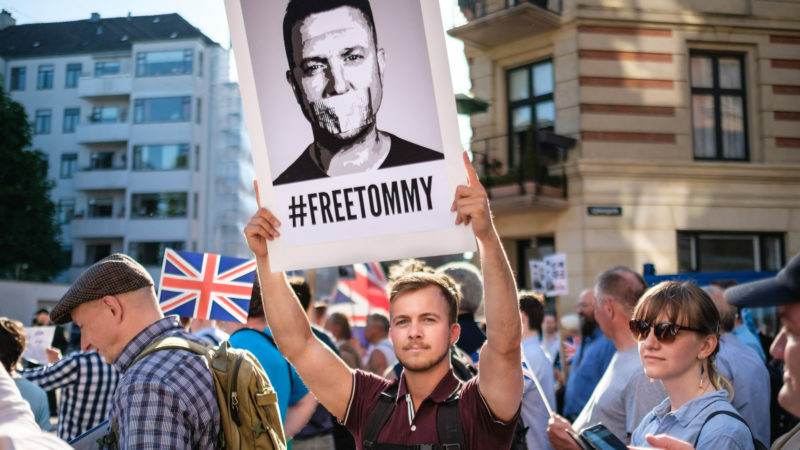 Last week, inveterate neo-fascist rallying figure Tommy Robinson – recently freed from prison and bail conditions after his contempt of court case was overturned – called a demonstration for December 9 under the banner of “The Great Brexit Betrayal”. The far right in its current form is broad, energised, and capable of calling large demonstrations with very little notice. This demo will be big, and building opposition on a scale large enough to soundly demoralise the far right should be a priority for the left. While the labour movement is also broad and energised, it must do more to marshal its forces into a dynamic and effective opposition to the far right. The Labour Party currently has the largest membership of any party in Europe, and its members, if organised, are capable of mounting a formidable mass street mobilisation and fightback against the far right. Despite John McDonnell’s calls for a ‘new Anti-Nazi League’, the party has still done nothing concrete to mobilise counter-demonstrations against Tommy Robinson’s assorted cronies now regularly marshalling thousands. And while Labour has always been a proudly antirascist party in name, its record on mobilising members to oppose the far right on the streets and actively supporting antiracist organisations has been mixed. At Labour Party Conference in September, Emily Thornberry delivered a barnstorming speech focused on fighting fascism, insisting that “we were there in Spain fighting Franco in 1936, we were there in Cable Street that same year fighting alongside the Jewish community to stop the Blackshirts”. While the sentiment is powerful, in fact the 1936 Labour Party conference voted against supporting the armed anti-fascist resistance in Spain, and subsequently moved to isolate or expel groups within the party which took the struggle into their own hands. The party also actively discouraged members from attending the anti-fascist mobilisation on Cable Street and promoted an official policy of boycotting it. When BAME members set up Black Sections in the 80s, demanding greater representation of black activists and their concerns, the Labour Party leadership resisted and carried out vicious back-handed political attacks on many of the Black Sections’ leaders and proponents. History shows that Labour Party activists must take the fight into their own hands, building for themselves the approach to antiracism and antifascism that we would like to see from our leadership. Labour Party members who agree there is a need for an activist network to argue for urgent action on antiracist policies and initiatives are organising as Labour Against Racism and Fascism. The new network aims to mobilise Labour Party members for antiracist and antifascist activities, including demonstrations and local campaigns, as well as to share experience and spread local antiracist initiatives across boroughs and Constituency Labour Parties (CLPs). We hope to see a large presence of Labour members on the streets on December 9 – at Robinson’s counter-demonstration – and give all of them the opportunity to shape this new initiative. There is a growing international dynamic to the far right movement today, with “Free Tommy” protests popping up around the globe, and Steve Bannon touring Europe to fund and create common purpose between far right groups. At the same time, xenophobic and racist rhetoric and attacks are at a high. This is why the left’s response must also be internationalist, building coalitions with women’s and migrants’ groups, and tapping into the new energy around the Brazil solidarity movement. We can start by organising an inclusive, working class coalition of opposition to prevent the far right from marching and spreading their oppressive ideas on December 9. We must then rise to the task of carrying through this momentum to build solidarity with oppressed groups across the Labour movement, including presenting a firm and coherent critique of how Labour’s own policies could be far more ambitious. That means tackling racist policies like detention centres, no recourse to public funds, and the ‘hostile environment’. That means organising now. In London that work has just begun. Urte Macikene is a supporter of the activist network Labour Against Racism and Fascism, and the youth officer of Dulwich and West Norwood CLP.